The beautiful Golden Tinfoil Barb is one of the most notable color morphs of the Tinfoil Barb Barbonymus schwanenfeldii. When kept in a school in a nice-sized aquarium, this attractive fish makes an awesome display. This truly striking fish has a golden or yellow body and a golden cast to its translucent fins without the reds and blacks of its parentage. Another common name it is known by is the Yellow Tinfoil Barb. This is an impressive fish for a large show aquarium. They are easy to keep but will grow rapidly and reach a size of up to 14 inches (35 cm) in length. These barbs are often sold when still very small with little information advertised as to their ultimate size. They are are usually a bit too big for most home aquariums and suggested for more experienced aquarists with the space and equipment necessary to support them. These very active fish will swim in all areas of the aquarium. To keep them happy, keep them in a school of 5 or more of their own kind. Though they are generally peaceful, they will eat smaller fish, so they are not always suitable for a community aquarium. They can be kept with cichlids. An aquarium best-suited to this fish is large and roomy, with a fine gravel bottom and dense plantings along the edges. They like to burrow so be sure to use hardy plants. There are several other selectively-bred color varieties of the Tinfoil Barb, including the familiar Albino Tinfoil Barb and a glass variety. Others are further distinguished by the naturally varying colors in their fins or eyes. This species is often subjected to various forms of artificial dyeing. Artificially-dyed specimens are sold under various names like the Blushing Tinfoil Barb as well as colored names like blue, pink, purple, and orange. Be sure to inquire about the type of specimen you are obtaining. Learn more about Artificial Colored Fish below. The Tinfoil Barb Barbonymus schwanenfeldii (previously Puntius schwanenfeldii) was originally described by Pieter Bleeker in 1853 as Barbus schwanenfeldii. This is the type species for a newer genus Barbonymus found in Thailand, Malayan Peninsula, Sumatra, and Borneo. It has been introduced in Singapore and other places as well. These Cyprinids inhabit large waterways including rivers, streams, canals, and ditches and will enter flooded fields to spawn and feed. In nature, these fish are omnivores with a largely herbivorous diet. They feed on filamentous algae along with aquatic and submerged plant matter as well as worms, crustaceans, smaller fish, and even the carcasses of dead animals. 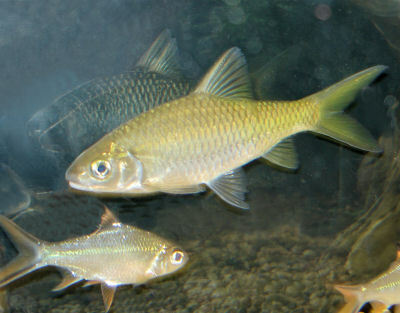 The Golden Tinfoil Barb is a captive-bred color morph developed from the Tinfoil Barb. Many of these barbs are captive-bred for the aquarium industry. Another common name it is known by is the Yellow Tinfoil Barb. No wild populations of these color morphs exist. The Golden Tinfoil Barb has a torpedo-shaped body with a rather high back and a forked tail. These large fish reach lengths up to almost 14 inches (35 cm) and have a lifespan of 8 to 10 years, though they can live longer with exceptional care. Large adults have golden or yellow bodies. The fins tend to be translucent, also with a golden cast. The reds and blacks of the Tinfoil Barb are absent. The Tinfoil Barb is imported in several other varieties, including the familiar albino color form along with a glass variety. Sometimes a specimen may be further distinguished as having a red or yellow tail, having black eyes, or a combination of these traits. Artificially-dyed specimens are sold under various names like the Blushing Tinfoil Barb as well as colored names like blue, pink, purple, and orange. Many albino and transparent fishes make an ideal 'canvas' for applying color to an otherwise rather plain specimen. For quite sometime, artificially-dyed specimens were considered an intriguing and eye-catching addition to the home aquarium. Today, however, as more has been learned of the processes involved, aquarists have raised serious concerns about the practice. Concerns are over the initial stress and possible pain to the fish, followed by a possibly higher susceptibility to infection. One method involves feeding them dyed food to make them colorful. This method is of very little concern, and the color is not permanent. Another method involves injecting dyes into the fish, as seen in the painted glassfish. This method puts the color onto specific areas of the fish's body. Lifespan: 10 years - Their average lifespan is 8 to 10 years. Golden Tinfoil Barbs are very hardy fish and easy to care for. They are easy to feed and maintain, but they do grow very large. The tiny, shiny fish that you first purchased will grow to be over a foot long and will need a large tank. Because of their cost and space requirements, they are not considered the best choice for the beginning aquarist. Since they are omnivorous, the Golden Tinfoil Barb will generally eat all kinds of live, fresh, and flake foods. To keep a good balance, give them a high quality flake food every day. They will also like some live food treats like worms or shrimps. Even though they like proteins, they need lots of vegetable foods. Vegetable substitutes include algae wafers, cooked lettuce, spinach, and oatmeal. When offering food just once a day, provide what they can eat in about 5 minutes. A rule of thumb when offering food several times a day is to offer only what they can consume in 3 minutes or less at each feeding. Diet Type: Omnivore - This fish needs a diet supplemented with vegetables as well as live foods. Aquariums are closed systems, and regardless of size, all need some maintenance. Over time, decomposing organic matter, nitrates, and phosphate build up and water hardness increases due to evaporation. To combat these ever-changing conditions, water should be replaced on a regular basis. Golden Tinfoil Barbs grow very large and will swim in all areas of the aquarium. They need a school of 5 or more of their own kind and a very large tank to be happy. A group of fully grown adults should be kept a tank that is at least 225 gallons. An external canister filter is needed to keep this messy fish's tank clean and will aid in maintaining high levels of oxygenation and water flow. Additionally, keep the tank securely covered as these fish are skilled jumpers and will probably do so if given the opportunity. These fish prefer a setup that replicates their natural habitat of flowing rivers and streams. A river manifold or powerheads can be used to create currents. Provide a substrate of sand or gravel with scattered smooth rocks and pebbles. These fish are large and can knock over most decorations. Large pieces of drift wood and firmly anchored plants can be used for decor. Make sure the plants are hardy varieties and not soft-leaved or this barb will feed on them. Immaculately planted tanks won't work well with this fish as it will gladly devour all but the sturdiest of aquarium plants. Minimum Tank Size: 225 gal (852 L) - This fish is happiest in a group of 5 or more, so they need a massive tank. The Golden Tinfoil Barb is not an aggressive species, but they will eat small fish if they have the opportunity. Slow-moving and shy fish are not good tankmates because the constant movements of this barb can stress them. Better tankmates are those of similar size and energy, such as other cyprinids, characins, and catfish. The Golden Tinfoil Barb is also one of the few fishes that can be kept with cichlids. In nature, Tinfoil Barbs can be found swimming in large schools. In the home aquarium, they will do best if kept with at least 5 of their own kind. If kept singly or in smaller groups, they may become aggressive or overly shy and fail to thrive. Peaceful fish (): Safe - Due to its large size, smaller fish are at risk of being eaten. Slow Swimmers & Eaters (): Monitor - They may stress less active fish. The Tinfoil Barb has been bred commercially, and a variety of color forms have been developed. The Golden Tinfoil Barb is one of them. This fish has not been successfully bred in the home aquarium. This species is aquacultured as food fish in their native countries and have been spawned with the use of hormones in aquaculture projects in Hawaii. Like other Cyprinid fish, these are egg layers that scatter their eggs rather than having a specific breeding site. The female will release thousands of eggs. Parents may eat the eggs and do not care for the young. The logistics of breeding a fish of this size are generally prohibitive to the average aquarist. It would take an enormous tank and the ability to raise the young separately from the parents. To learn about breeding Cyprinids, see the description of breeding techniques in Breeding Freshwater Fish: Barbs. Ease of Breeding: Difficult - Although not difficult to accomplish, breeding a fish of this size is generally prohibitive to the average aquarist. Golden Tinfoil Barbs are very hardy, so disease is not usually a problem in a well-maintained aquarium. That being said, there is no guarantee that you won't have to deal with health problems or disease. Anything you add to your tank can introduce disease. Not only other fish but plants, substrate, and decorations can harbor bacteria. Take great care and make sure to properly clean or quarantine anything that you add to an established tank so as not to upset the balance. The Golden Tinfoil Barb, as well as other varieties of Tinfoil Barb, is readily available both in stores and online. They are moderately inexpensive though prices vary depending on size. Just bought 3 barb called 'Golden Redfin Tin Foil Barb' but they just look albino to me with pink eyes, and very little fin color. They seem to love our 20 gallon aquarium with 2 leopard loaches, but now that I see how big they can get I am concerned they will outgrow the tank! How long will I have and will my 6 loaches be in danger later? Most likely, they will outgrow your aquarium. To be honest, I would not recommend housing a Tinfoil Bard, in an aquarium smaller than 75 gallons. 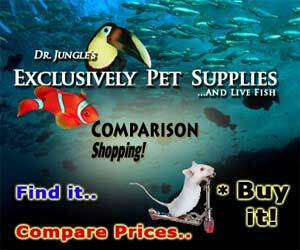 So, purchasing a new aquarium, may be something you may wish to look into very soon! I would try to upgrade the aquarium size, as soon as I could. As for the Leopard Loaches, I would not think the Tinfoil Barbs, would attempt to attack them. However, with fish, I may be wrong. Hello, my name is mark and I have two tin foils myself. My comment is, I'm curious to know the sexes of my barbs. I have an idea but, need professional knowledge. I purchased my tin foils as babies (about 2") and still have them 5 years later. They are doing great.....I just want to know if I have a male and female. Please help? Thanks, mark. I have a couple of tinfoil barbs, 1 red tail and 1 albino, in a 400lt tank. The older one is about 3 years old and almost 20cm and the other is 2 years old and 15 cm long. Both of them are active swimmers and always move around the tank. I am very pleased with them, they are timid and shy and they are getting along very well with the other fish (2 red parrots, 3 severums, 1 silver dollar, 1 geophagus, 3 clown loaches, 3 botia, 1 pleco, 2 synodontis, 1 royal pleco, 2 kribensis, 1 keyhole cichild etc.). For sure I suggest them for an "active" tank!